A central focus of the Working Group on Europe, Russia and Ukraine was the relationship between concepts of identity, language and history and the role these ideas play in the current stalemate affecting Russia’s attitudes towards the EU and vice versa. 1. Analysis and discussion of assumptions and interests of the EU in the East. Have European interests been reactive, reflecting the regional dynamics? What was the role of smaller actors, rather than Berlin, London, Paris, and Brussels in the formation of these assumptions and interests? What is the impact of the United States and NATO? Economic interests and values of EU in the East – how to deal with contradictions? What is EU attitude to the politics of memory and frontiers in Ukraine and other countries of the region? 2. Analysis and discussion of regional and global dynamics. What are drivers and “isms” in Russian behavior? What is the normative aspect of Russia-EU contestation and Ukraine’s role in it? What does Russia’s (possible) turn towards Asia mean for EU? 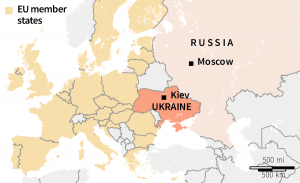 What are conceptions of Greater Europe in Brussels, Paris, Berlin, and Moscow? Should EU oppose or engage Eurasian Union? 3. Analysis and discussion of the Russian-Ukrainian crisis. How much is the crisis a “game changer” and in what respects? Should promotion of democracy and regime change be among EU strategic goals? Containment and engagement of Russia – how do they look as strategic visions? Is Common Space framework now dead? Is “Europe from Lisbon to Vladivostok” a viable project? What is the future of international law in this area? Will the crisis affect EU interests in other areas inside and outside the European theater (nuclear proliferation, wider terrorist challenges, Iran, climate change etc.)? Vladislav Zubok is Chair of the Working Group on EU and Russia and Ukraine Relations. He is Professor of international history, with expertise on the Cold War, the Soviet Union, Stalinism, and Russia’s intellectual history in the 20th century. His most recent books are A Failed Empire: the Soviet Union in the Cold War from Stalin to Gorbachev (2007) and Zhivago’s Children: the Last Russian Intelligentsia (2009). His books earned the Lionel Gelber Prize and the Marshall Shulman Prize of the American Association for Advancement of Slavic Studies. Aside from academic work, Professor Zubok organized a number of international archival and educational projects in Russia, Ukraine, and South Caucasus. He held numerous fellowships, including the Norwegian Nobel Institute, the Wilson Center in Washington DC, Collegium Budapest, the Free University for Liberal Studies in Rome, the Rockefeller Center in Bellagio, and the Hoover Institute at Stanford University. Dr Cristian Nitoiu is a Postdoctoral Fellow in EU-Russia relations and Ukraine at LSE IDEAS. He is an expert on EU and Russian foreign policy, EU-Russia relations, Eastern Europe, international relations, the European public sphere or international political communication. Before coming to LSE he held research positions at Trinity College Dublin and the College of Europe (Natolin campus, ENP Chair). His book on ‘EU Foreign Policy Analysis: Democratic Legitimacy, Media, and Climate Change’ will be published in June by Palgrave. He is currently working on a book on EU-Russia relations during Putin’s third term and a project on the European Parliament’s approach towards the post-Soviet space and Russia. Natalia Telepneva is a Research Associate for the EU-Russia/Ukraine Working Group, Dahrendorf Project, at LSE IDEAS and teaches in the International History department at the LSE. Dr Telepneva earned her PhD in International History from the London School of Economics and Political Science (LSE) in 2015. Her dissertation, titled “Our Sacred Duty: the Soviet Union, the Liberation Movements in the Portuguese Colonies, and the Cold War, 1961-1975” and supervised by Professor Odd Arne Westad, analyzed Soviet relations with the liberation movements in the former Portuguese colonies during the colonial wars. Natalia Telepneva was awarded with the Maurice Pinto PhD Scholarship for the years 2011-14. She has a MA in International and Global History from Columbia University and the LSE and a BSc in International Relations and History from the LSE. Liza Ryan has been at LSE IDEAS since 2010 as project administrator for the Paulsen Fellowship Programme, bringing early-career historians from Russian regional universities to LSE. She previously worked for many years as a trader and project manager for a private company in the sugar industry and agribusiness sector in Russia. She holds a Master’s degree (with distinction) from Imperial College at Wye in Economics of Rural Change, with focus on transition economies, and BA in Russian and Soviet Studies (UCL SSEES). Professor James Hughes holds a chair in Comparative Politics at LSE. He is the Convenor of the MSc Conflict Studies, and Director of the Conflict Research Group. His research and publications span the study of political violence and terrorism, democratisation, secession, and national and ethnic conflict. His major studies include critiques of the role of the EU’s conditionality and intervention during enlargement to Eastern Europe, notably in his co-authored book The Myth of Conditionality (Palgrave, 2004), and of the EU’s developing conflict resolution capacity, in his edited book EU Conflict Management (Routledge, 2010). Roy Allison is Professor of Russian and Eurasian International Relations, University of Oxford and a Fellow of St. Antony’s College. He is head of Russian and East European Studies, as well as Director of Research, in the School of Interdisciplinary Area Studies at the university. He was Reader in International Relations, London School of Economics to 2011 and Head of the Russia and Eurasia Programme, Chatham House, during 1993- 2005. He is the author or co-author of five books and the editor or co-editor of five more. His most recent books are Russia, the West and Military Intervention (Oxford University Press, 2013) and Putin’s Russia and the Enlarged Europe (co-authored, Blackwell, 2006). Alexey Miller is Professor of History at the European University, St-Petersburg and Visiting Professor, Central European University (Budapest), Department of History. His main areas of research are history of concepts; comparative history of empires; Russian nationalism and empire; memory politics in Central and Eastern Europe. His publications in English include The Romanov Empire and Nationalism. Essays in Methodology of Historical Research. (Budapest-New York, CEUPress, 2008) and The Ukrainian Question. The Russian Empire and Nationalism in the Nineteenth Century. (CEU Press. NY-Budapest, 2003). He is currently working on a book “Memory Politics in Putin’s Russia” to be completed by the end of 2015. Professor Georgiy Kasianov is Head of the Department of Contemporary History and Politics, at the Institute of Ukrainian History, National Academy of Sciences of Ukraine and Visiting Professor at the Berlin Free University. His main research areas include modern history, the history of ideas, Ukrainian history 19 – 21 centuries, and modern historiography. He has participated in multiple international projects, such as Region, Nation and Beyond. An Interdisciplinary and Transcultural Reconsideration of Ukraine (in progress), in cooperation with St. Gallen University and Occupation and revolution in Ukraine 1918 – 43 1921 (2010), in cooperation with Ludwig Bolzmann Institute (Graz, Austria). Since 2014, he has been President of the International Association of Humanities. Elena Korosteleva is Professor of International Politics and Jean Monnet Chair of European Politics. She is co-founder and co-Director of the Global Europe Centre, at the University of Kent, an inter-disciplinary and cross-site (Brussels and Canterbury) centre with the focus on Europe’s international relations. Elena serves as a member of the International Advisory Board for the GLOBSEC and Central European Strategy Council; member and trustee of the executive committees for BASEES and CEELBAS, and a visiting Professor of the College of Europe (Natolin), Armenian and Belarusian State Universities.